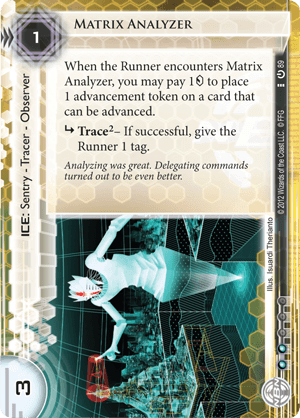 When the Runner encounters Matrix Analyzer, you may pay 1credit to place 1 advancement token on a card that can be advanced. Analyzing was great. Delegating commands turned out to be even better. this is also possible with Shadow. Shadow however has an upper limit on its price tag (2 credits and a tag) so Ice Wall seems stronger.